ST. AUGUSTINE, Fla. - Paris Byrd, the St. Johns County girl who died after collapsing during basketball tryouts Tuesday at R.J. Murray Middle School had an enlarged heart, to medical examiner's preliminary report found. Deputies said Paris went into medical distress in the gymnasium just after 3 p.m. She was taken to the hospital by Fire-Rescue personnel, but she could not be saved. According to the preliminary autopsy, Paris died of hypertrophic obstructive cardiomyopathy and her death was ruled accidental. Through tears while sitting on her front porch Wednesday morning, Erika Lowe remembered her youngest daughter. She said she never knew how many lives her daughter touched in her 13 years until she saw the outpouring of support she has received in the last 24 hours. "I just miss her. That was my angel; that’s my baby girl," Lowe said. Lowe said that while Paris was born premature, weighing only 5 pounds, she was not showing any signs of health problems as a young teenager and as an eighth-grader, she was excited to be trying out for the team first time. "I’ve seen so much and I’m so ever thankful and grateful because she left a mark on people’s lives. And it was a positive one," Lowe said. "I’m so proud because my baby girl, she lived her life in these last 13 years. And she did things a lot of kids her age haven’t done." The mother said she never thought her baby girl would pass away doing something she loved. "I gave her my blessing to do it, and now she's gone," Lowe said. Lowe said her own sister died in 2004 seeing Paris in the hospital brought back those feelings. "I saw my sister. In that same position, and the only thing I could think of was, 'She’s going on to a better place,'" Lowe said. Vincent Byrd said that when he recently asked his daughter what she was planning to do with her life, Paris had a quick answer: "I'm going to college at Florida State and I want to be a lawyer." The family has set up a GoFundMe page to help with Paris' funeral expenses. "She was an amazing child that had a bright future ahead of her," her third-grade teacher a Crookshank Elementary School wrote on the page. "Help will be needed to get through this trying time. If you are able to support this wonderful family in any way, it would be so appreciated." Another GoFundMe post post says: "God has gained an angel," Paris was described a kind, respectful child with a beautiful smile who always made the honor roll. "Paris is one of five kids raised by a single struggling mother who can not afford a proper memorial," Tara Poveda wrote on the page. 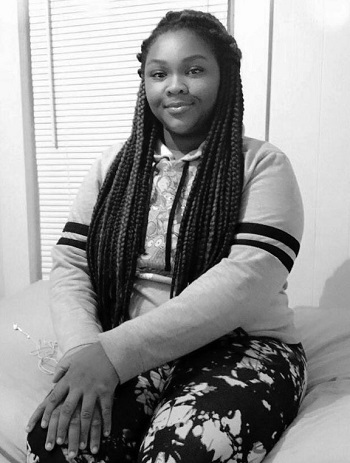 "We are asking the community to please come together and help with anything to give this 13-year-old's mother the funds to have a proper memorial for her beloved daughter." Wednesday was difficult for Murray Middle students, many of whom shed tears in the hallways when they learned about Paris' death. Friends described her as a humble, funny, intelligent and sweet girl. One told News4Jax that Paris' death was an extremely tough loss for anyone who knew her. Later in the evening, loved ones came together at the Solomon Calhoun Community Center to release a sea of purple balloons in memory of Paris. "I loved her. I miss her. Nobody could ever replace her spot," Yelitza Garcia, Paris' best friend, said. "She was kind, grateful and polite." During the "celebration of life," dozens gathered to pray. Friends said Paris' bright smile will be the one thing they'll always remember. "She had a beautiful smile, a wonderful personality and when she walked in, she lit up the room," family friend Jennifer Stewart said. "She made everybody feel comfortable and she'll be truly missed." "It is with extreme sadness and a heavy heart that I relay the news that one of our very own students has passed away this evening. It is out of respect for the family that I do not relay her name at this time. "Many students, teachers, school staff and parents will be reeling from this news. We will have our crisis team which includes grief counselors, district staff, school counselors and social workers on site tomorrow, and for as long as needed, to support the entire school community. "We will also have materials posted on our website to assist you in speaking to your children about this tragedy. "I ask that you keep all of our Bulldogs in your prayers and for the parents at this time."